What is the best hosting plan for my WordPress website? Shared vs. Managed? There are thousands of hosting companies out there that offer cheap, shared hosting. The low monthly cost lures customers in, sometimes as low as $6 a month. Most of these meet the minimum requirements outlined by WordPress.org. Companies that offer cheap rates are able to do that because they place hundreds, sometime thousands, of websites on the same server. You are “sharing” the server space and resources with all these other sites including bandwidth, processing power, storage. Each server has a fixed amount of memory and if one or more of the sites on the server is using a chunk of memory all the other sites suffer and will load slow. Search Engines do not like slow sites. For more information on how and why Google rates sites based on page speed, read this article. Managed WordPress hosting typically includes software and is configured to exclusively run WordPress including server-level caching, running the latest tested version of PHP, MySQL and Apache. On a shared environment you are sharing the good stuff (resources) as mentioned above, you are also sharing the bad stuff. If one site is hacked and malware is running on a site, the other sites on that server are now vulnerable. If any one site on the server is compromised, it literally opens a gateway for the attacker to gain access to the other sites. In my 20+ years of web development I have unfortunately seen many sites hacked on a shared hosting environment. It is not the case of “if” it will happen, but “when”. Often the discount hosting company will then push the client to purchase site security software (SiteLock) which I have seen fail time and time again. DO NOT buy it! 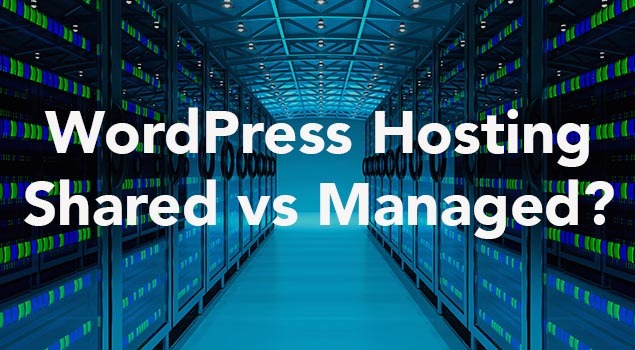 Move your site to a Managed WordPress host instead. Every site should have an SSL certificate installed. Discount hosting companies will charge you extra for this, sometimes as much as $70-$80 per year. A good managed WordPress host will offer this for free. More Information on SSL Certificates. Implementing a backup schedule is one of the most important things to have on a hosting plan. Most managed WordPress hosting plans include automated daily backups, and a quick and easy restore function if you need it. Make sure the host maintains a history of backups, one per day for example. So if you have to go back 3 days to a clean version of your site it has not been overwritten by last night’s backup that was already infected. When you need technical support, nothing is more frustrating then being placed on hold for extended periods of time only to speak to a representative outside the U.S. who is not a WordPress expert. How much is your time worth? The “cheap” hosting quickly becomes very expensive! Baldwin Web Design works with Flywheel Hosting and plans start at $28 per month. Not bad for all the security features it offers. Don’t panic! We can help. We can get your site migrated for FREE to Flywheel. Contact Us to get started. Carla is the owner of Baldwin Web Design. She is the lead developer and project manager with over twenty years of professional experience in web development and digital marketing.